(a) The energy balance in the atmosphere ----------------------------------------- 4 February 1954 Was in Washington D.C. today. Learned in O.N.R. that they have got 20 Deacon rockets (surplus in Point [Magu?]) and 20 General Mills balloons for a 1954 rockoon expedition to the Arctic. 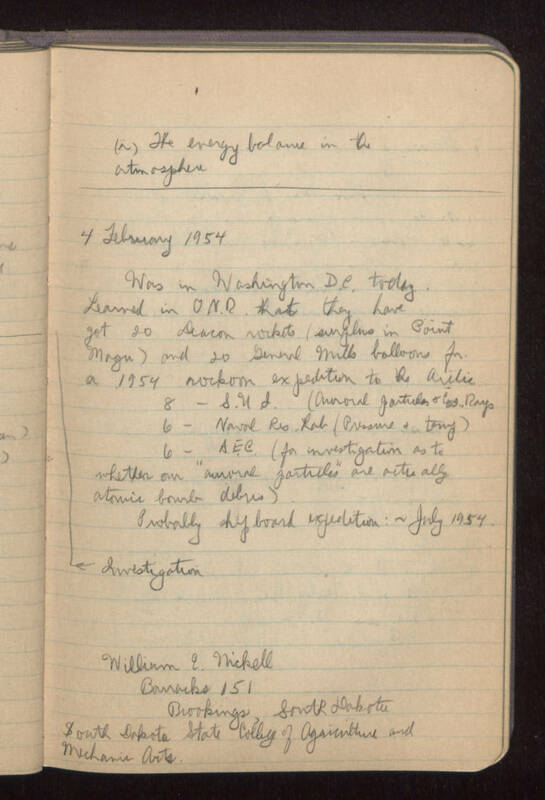 8 -- State University of Iowa (auroral particles and cosmic rays) 6 -- Naval Research Lab (pressure and temperature) 6 -- A. E. C. (for investigation as to whether our "auroral particles" are actually atomic bomb debris) Probably shipboard expedition: ~July 1954. Investigation (see step (c) on previous page) William E. Mickell Barracks 151 Brookings, South Dakota South Dakota State College of Agriculture and Mechanic Arts.